From the outside, you cannot really tell, that there is a rock climbing gym inside this building. 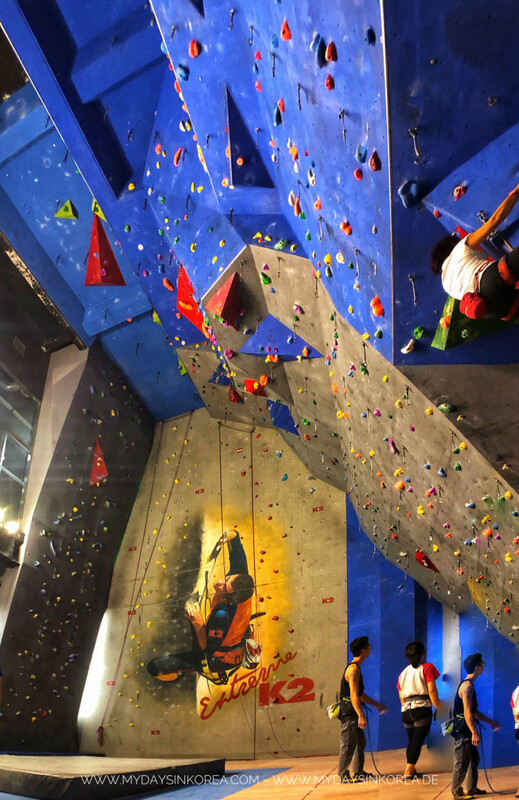 But guess what, it even features more than that: not only rock climbing and bouldering, but also fitness studio, pilates and golf. At the reception behind the main entrance, you can register for the visit and pay the entrance fee. 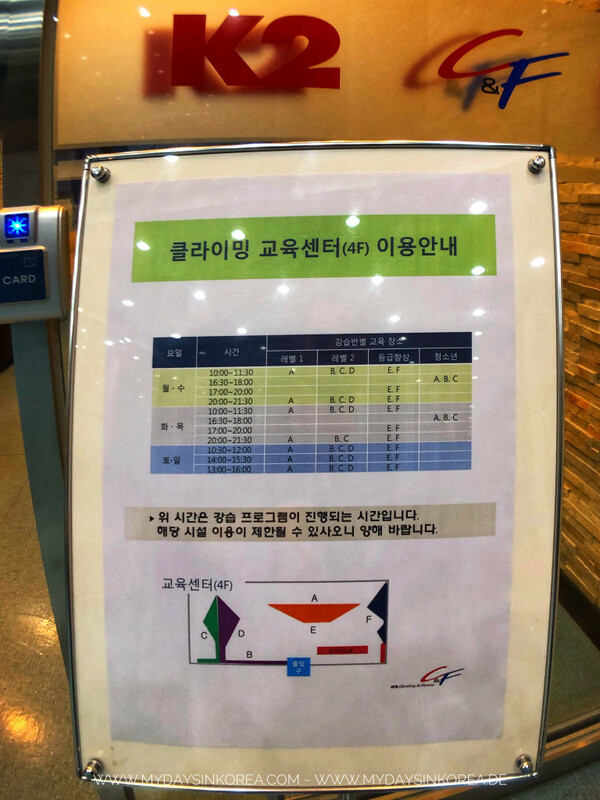 A day pass costs 40.000₩, which is really expensive in my opinion. If you plan to go there more than 2 times a month, go for a monthly pass for 100.000₩. You and your climbing mate also need to pass a short test of climbing and belaying before you can start. 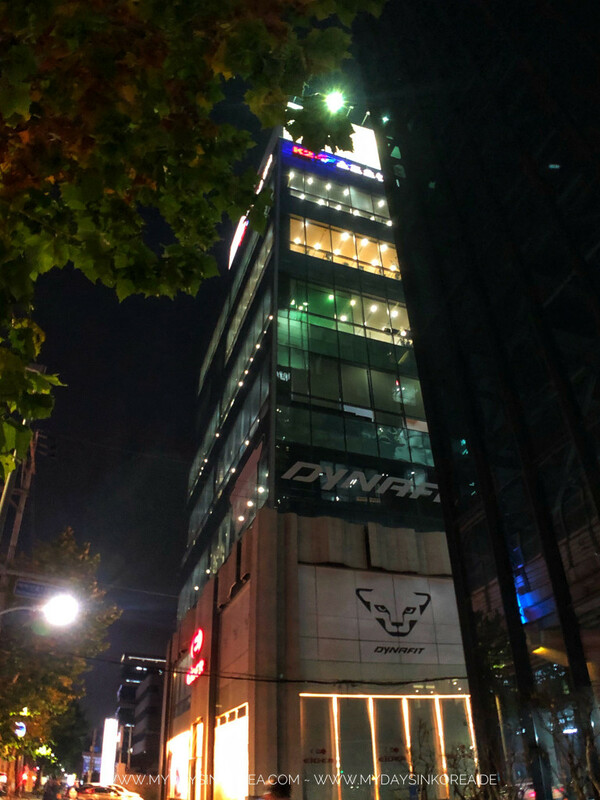 It’s also similar to The North Face. 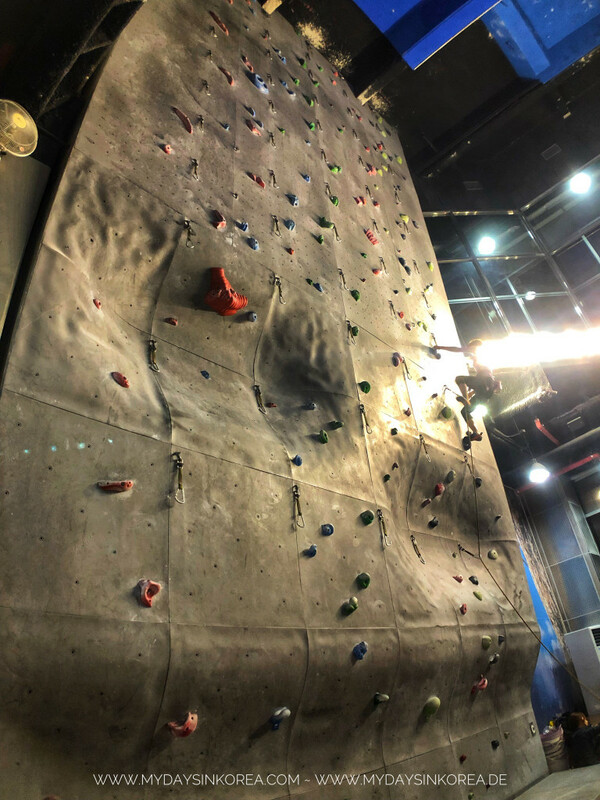 If you’re beginner and don’t know how to belay, you need to visit a course first. Once you have paid the entrance fee, you’ll get keys for the shoes cabinet and for the locker. 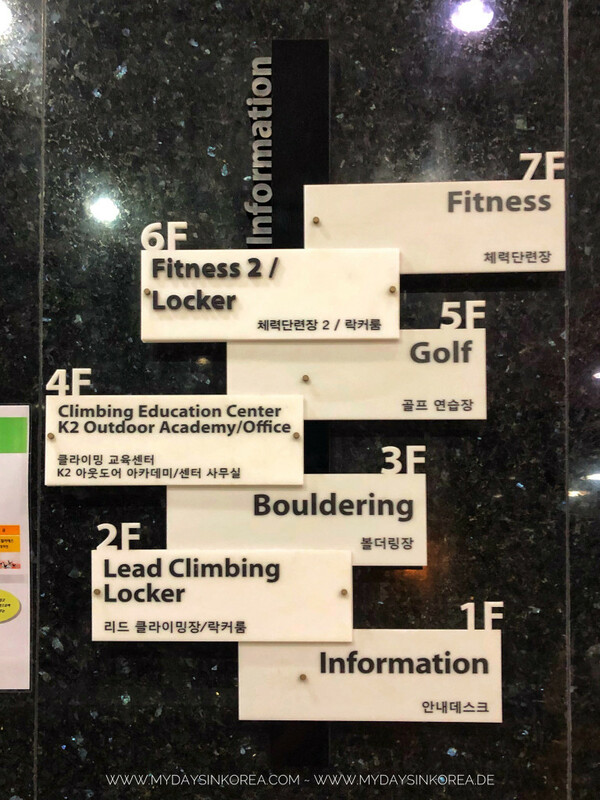 The locker rooms are located on the 2nd floor, same as the climbing gym. There are two more bouldering gyms full interesting problems on 3rd and 4th floor! I was really excited to hear that 😆! With the keys you can enter the locker room. There are enough lockers and space for many people to store their stuff, a big mirror, basin, a rack filled with fresh clothes and towels for you to use, as well as a shower room. 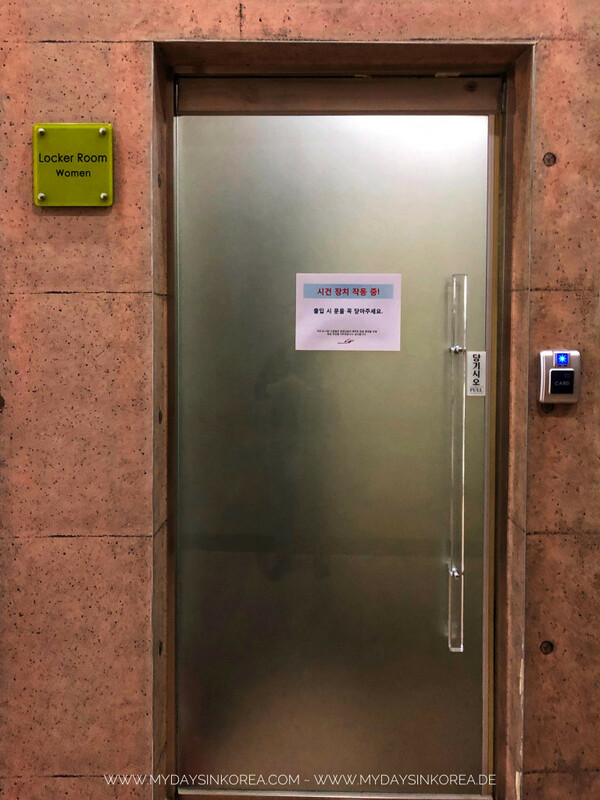 Furthermore, floor heating as well as air conditioning are equipped in the whole building, so that you can feel comfortable in all weather conditions. 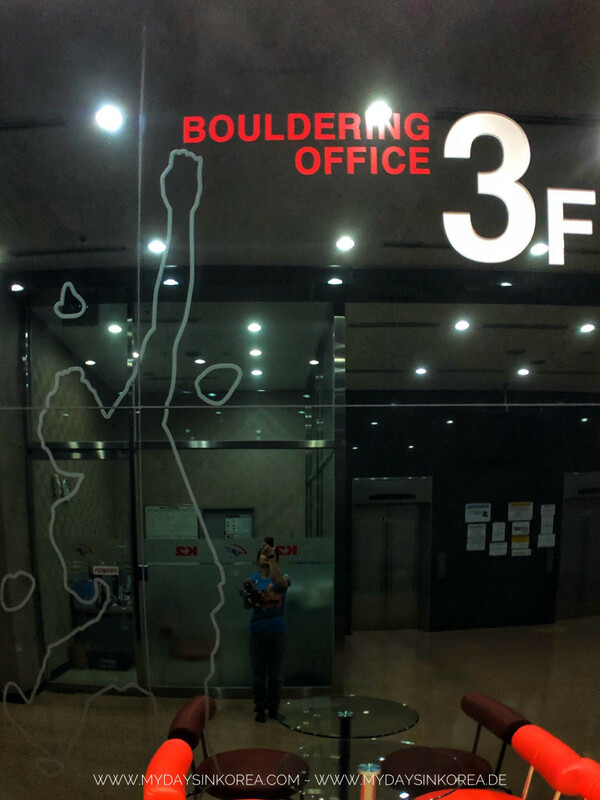 As I already mentioned before, you can go bouldering on the 3rd and 4th floor, climbing on the 2nd. 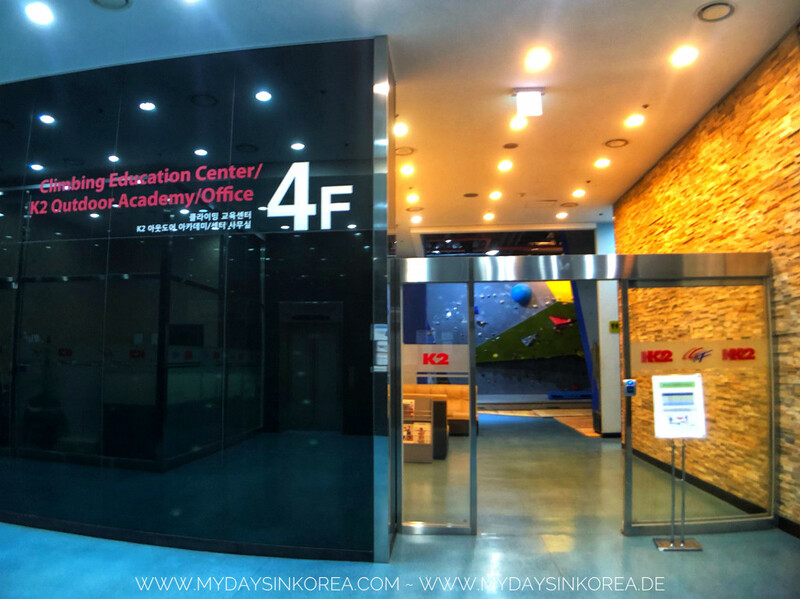 The facility on the 4th floor is usually used for training purposes. 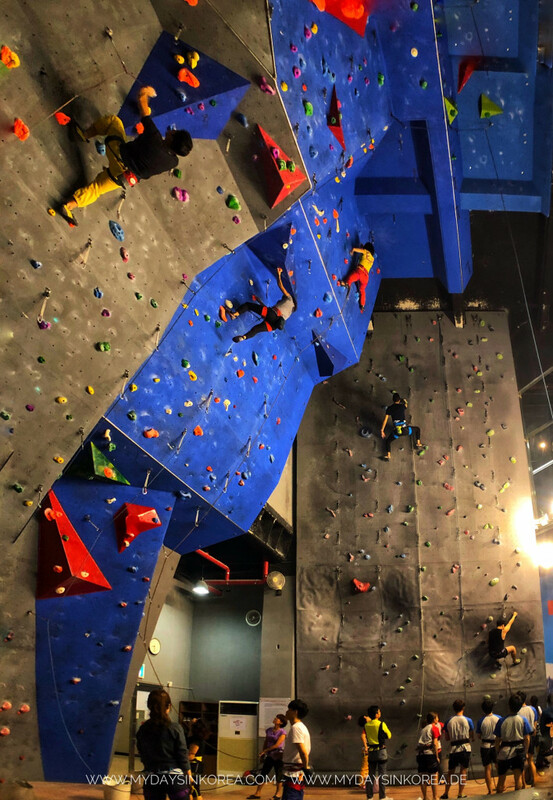 You can have Outdoor, indoor rock climbing, ice climbing, camping, etc. lessons with professional trainers at K2. The bouldering problems are built neatly and long, as a climbing route. They also have rock climbing grade. 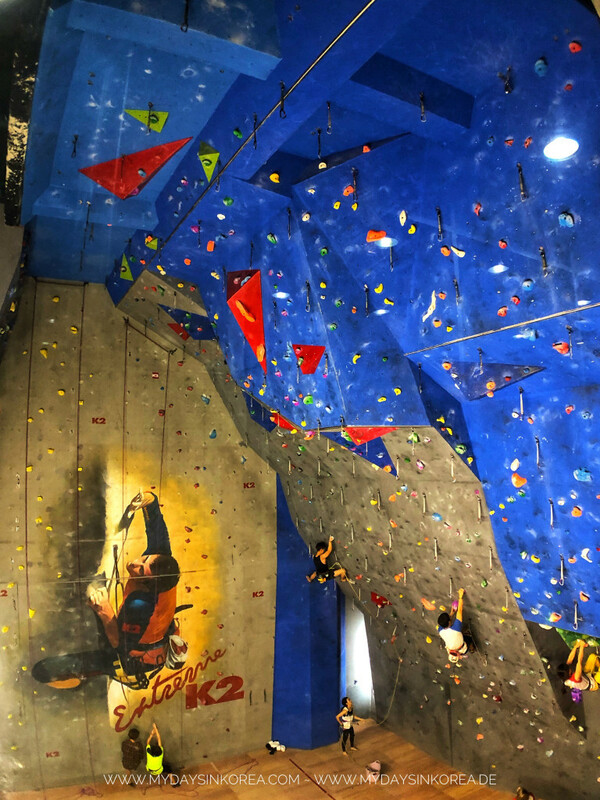 On the 3rd floor, you can climb on 500m2 large bouldering wall. 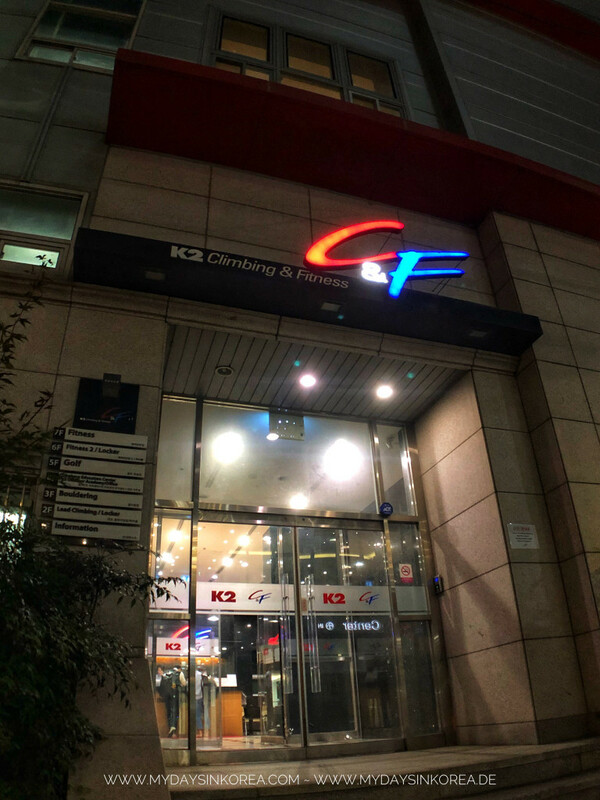 It is comparable with other bouldering gym such as The climb Hongdae or NTF. Either short or long, with or without overhang, or free style route, you can find all here. 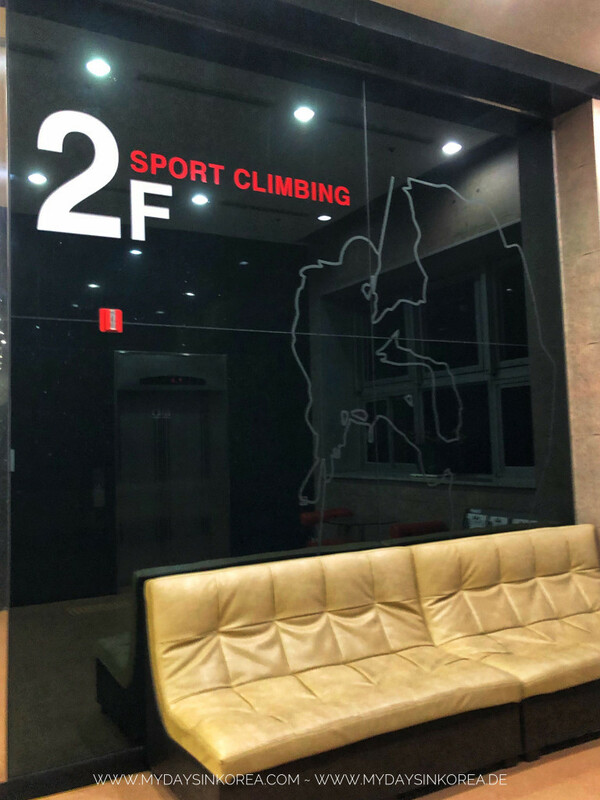 From the 3rd floor, you can even watch people climbing on the wall of the rock climbing area from a huge transparent wall. The wall of the rock climbing area is about 12m high. There are only 2 top rope routes for beginners. Others 30 are from 5.9 (6). All routes seem to be really well maintained. You can climb the roof as well! In this gym, people use basket to keep and transport the rope. On a Wednesday evening, I went to K2 with my climbing mate, Danny, and his friends. The boulder areas were almost empty. I could warm up and cool down by climbing some easy problems there. The climbing area was in fact full with rock climbers. 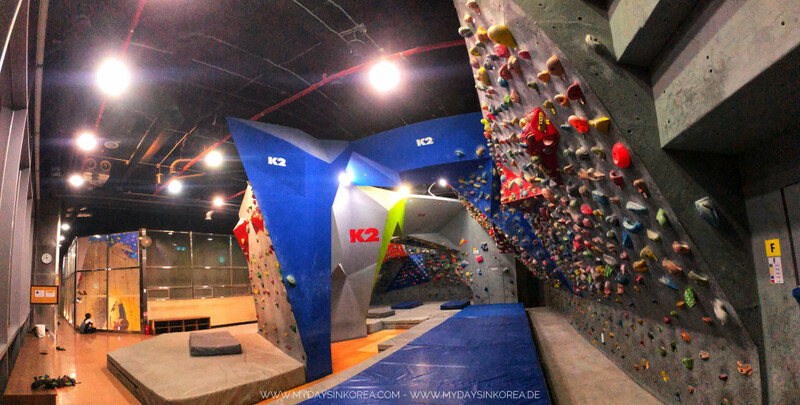 It reminded me a lot of the DAV climbing gym in Stuttgart, where I used to go for training in Germany. Every Wednesday it was packed with people, lively and noisy. We had a lot of fun climbing at K2. We also decided to buy a monthly pass, to go there more often. After climbing, we crossed the street to get to the restaurant area. 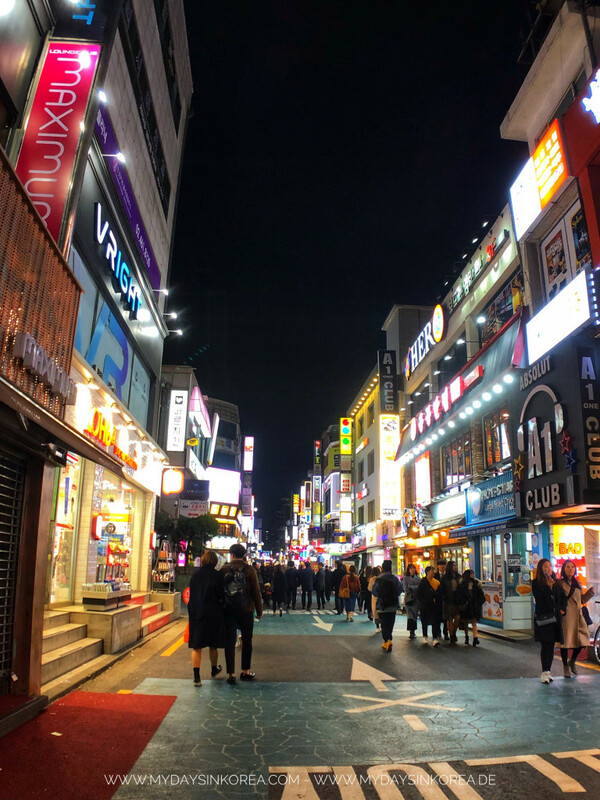 Since it’s close to Konkuk University, there are a lot of stores and restaurants near by. 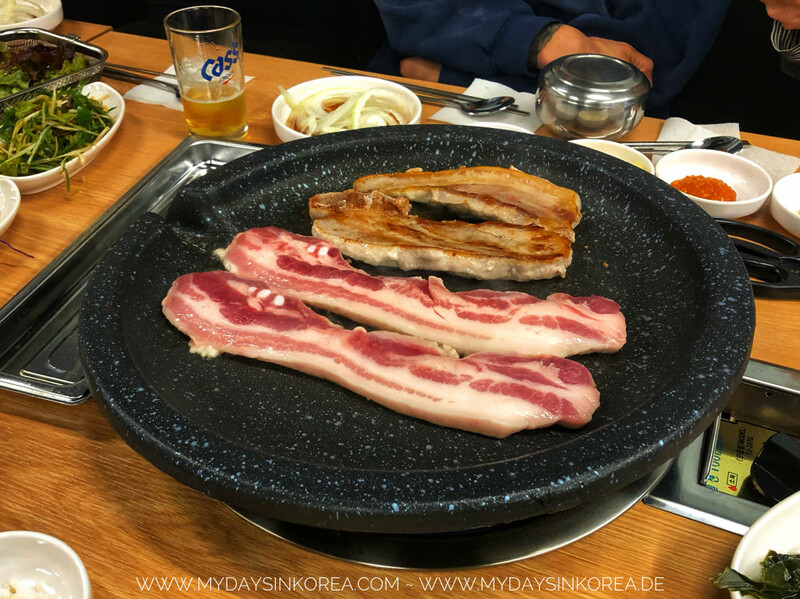 We had some Samgyeopsal, drank So-Mek, talked, laughed and made new friends. 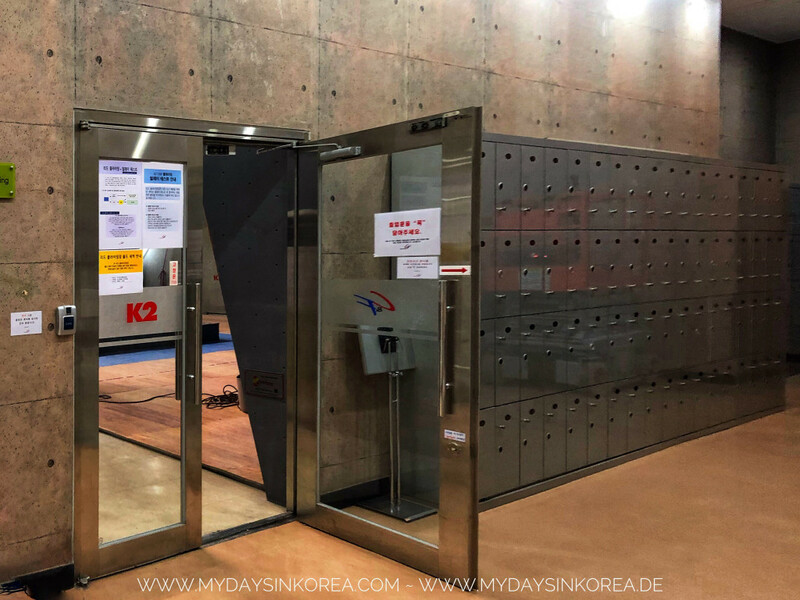 If you buy a monthly card for the gym, you can also rent a permanent locker. It costs 8.000₩ per month. Currently I have one at K2 to keep my rope and harness, so that I don’t have to carry it with me everytime I go climbing. In the evening and at weekends, the climbing area might be packed. There is an unwritten rule that you should know: after you finish a climbing route, you should always change to another one. In this way, other people also have chance to climb the route that you’ve finished. Of course, you can come back later, after finish the other one. 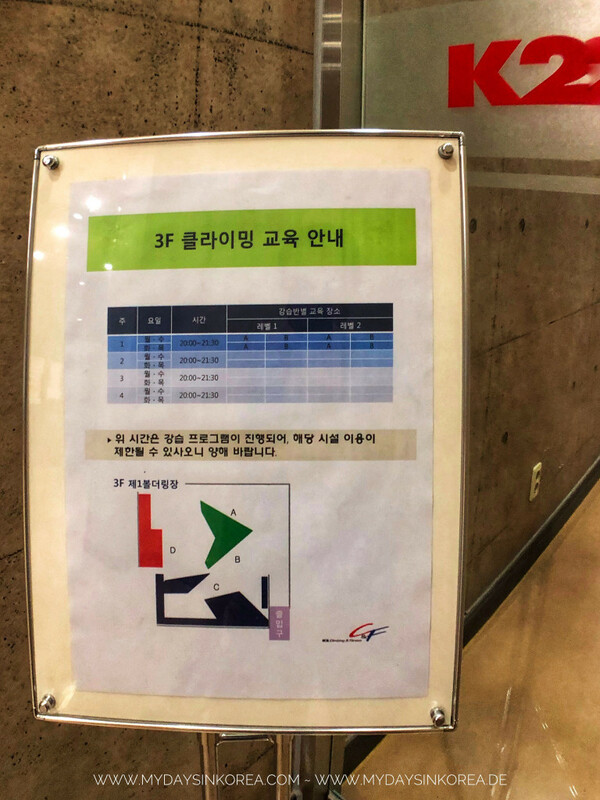 There is an announcement of K2, that the climbing areas will be closed permanently in 2 months. A lot of climbers want to stick with it, hence they’ve signed a disagreement and sent it to K2. Let’s see, how long the gym’s gonna last. Route settings: ⭐️⭐️⭐️⭐️⭐️ – a lot of options in three gyms on three floors! It’s awesome! For more information, please visit K2 C&F’s Homepage or their Facebook Page.